Company will not offer custom engravings upon launch due to sub par quality in beta tests. The Moto X may have a lot to offer as far as customization and variety, but it has definitely stumbled out of the gate in delivering these options to customers. Things started off on the wrong foot when Google announced that the Moto Maker tool would be exclusive to AT&T customers for a period of time and now the custom engraving option won't be available at launch. According to a Motorola spokesperson, potential buyers won't be able to add a custom engraved message to their Moto X phone when it launches this Friday. The company does not feel that the engravings met overall quality standards during beta testing and decided to pull the plug. The feature is eventually expected to be available for the smartphone, but Motorola has yet to reveal any sort of time frame. 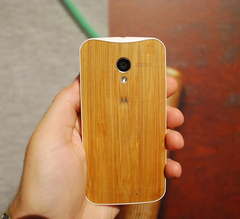 So far, the Moto X has been confirmed for AT&T and Sprint for the 23rd of August and for Verizon on the 29th of August. The device will be available in 16GB and 32GB models and will start at $199.99.